Premier League: Park Utd 1 Killumney Utd 0; Kilreen Celtic 3 Blarney St Ath 1. Park Utd celebrate Premier League title win. Runners upo Killumney are top right. AUL 2: Rylane Celtic 1 Blackpool Celtic 1. STRAND UTD V RYLANE AT BALLYANLEY AT 7PM. CATHEDRAL CELTIC V KNOCKRAHA IN FAIR FIELD AT 7PM. Ger O'Brien is presented with the City Challenge Cup by Martin Conlon following their 2-1 win over UCC A at the Cross on Tuesday night. 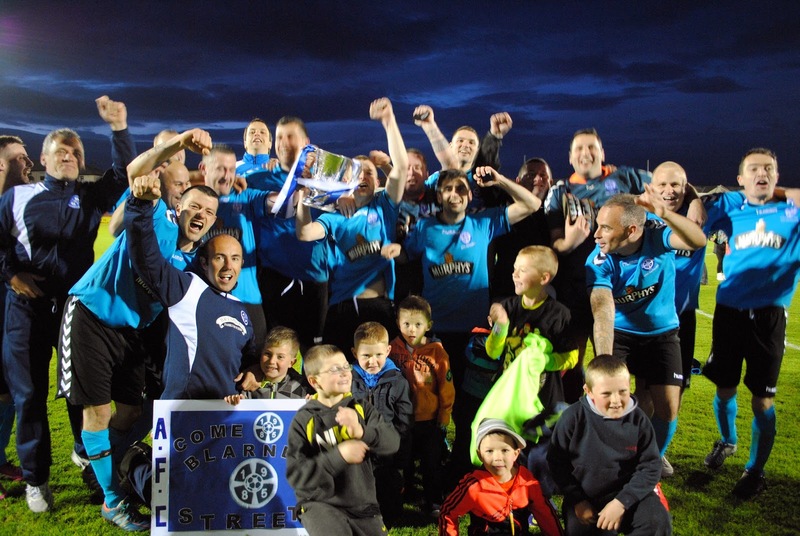 Crescent Athletic players celebrate after being presented with the City Challenge Cup at the Cross on Tuesday night. 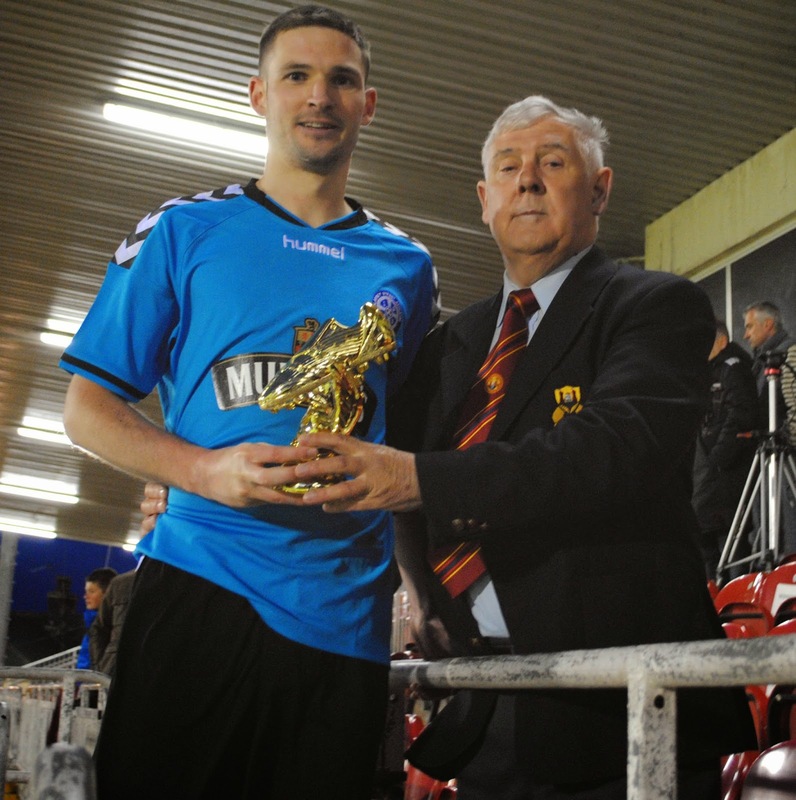 Lloyd Leahy is presented with the man of the match award after the City Challenge Cup Final at the Cross on Tuesday night. City Challenge Cup Final: Crescent Ath 2 UCC A 1. Premier League: Coachford 0 Kilreen Celtic 3. AUL 1A: Waterloo 2 Dunbar Celtic 1; Richmond 6 Hibernians 1. AUL 2: Strand Utd 2 De Courcey Albion 4. 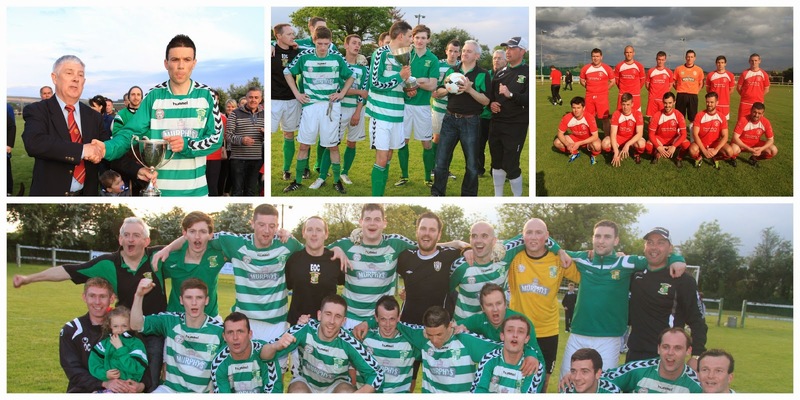 AOH Cup Final: Blarney St Ath 0 Kilreen Celtic 0 (Blarney Street won 5-4 on pens aet). Premier League: Killumney Utd 3 Pearse Celtic 1. AUL 1: Kanturk 3 Lakewood Ath 1; Bohemians 0 Fairview 4; Dillons Cross Ath 0 Knockraha 1. AUL 1A: Waterloo 1 Hibernians 2. AUL 2: Rylane Celtic 6 De Courcey Albion 1; Strand Utd 4 Blackpool Celtic 0. AUL 2A: Shandon Celtic 2 St John Boscos 1. AUL 3A: Pearse Celtic 6 Crescent Ath 4; St John Boscos 2 Leeview Ath 3. AUL 3: Greenwood 1 Glenthorn Celtic 2; Castlelack 1 Parkview Celtic 3. AUL 3B: Ballincollig 4 Glanworth Utd 0. The Street's Captain Anthony Peelo gets presented with the AOH Cup from Ted O'Mahony (Chairman of the Cork AUL) at the Cross on Friday night. 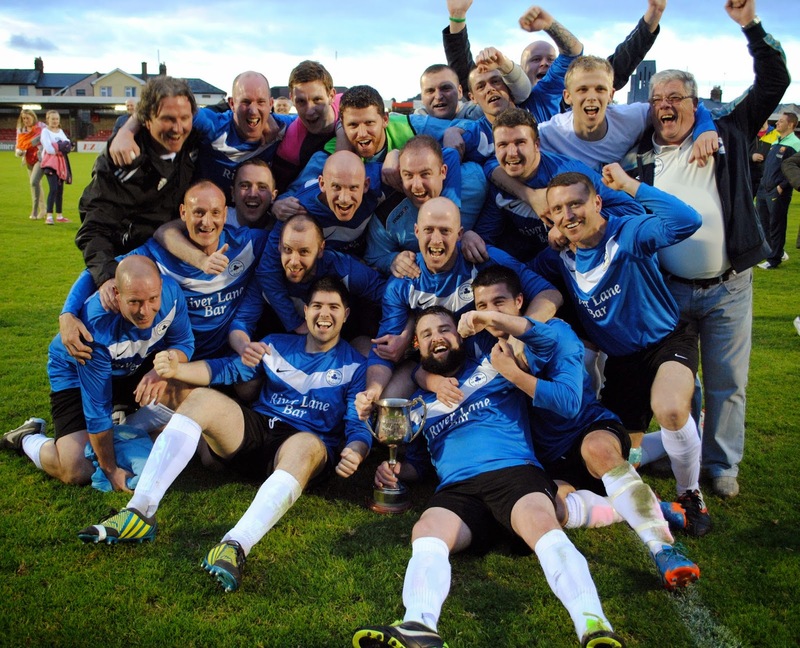 Blarney Street Athletic players and friends join in the celebrations after winning the AOH Cup following their 5-4 penalty shoot-out victory over Kilreen Celtic after it was 0-0 over extra time. 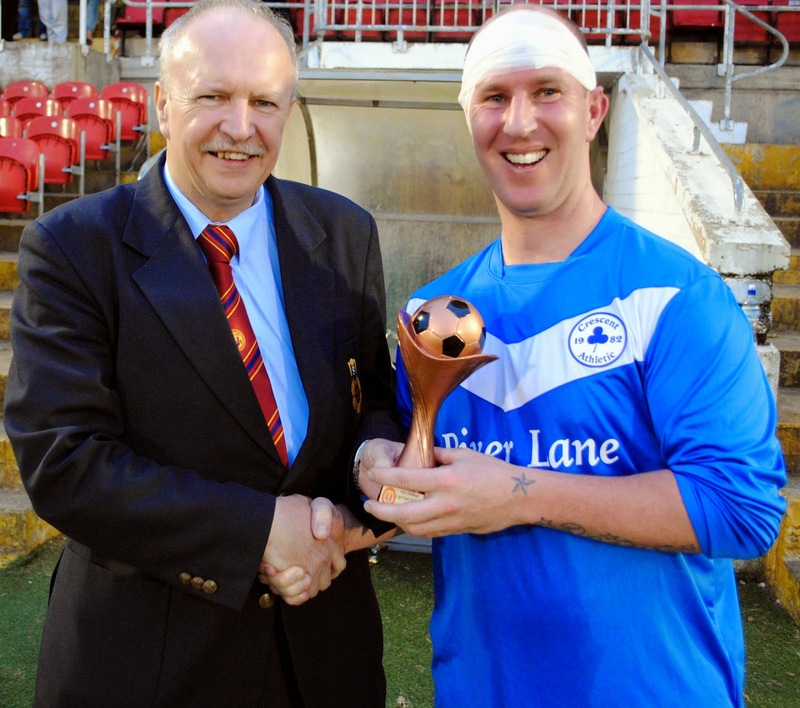 George Kenny receives his man-of-the-match award at the Cross on Friday night. AUL 3A: St John Boscos 3 Carrigtwohill Utd 1. County Cup Semi Final: Kanturk 1 Hibernians 3. AUL 1: Ballinhassig 1 Bohemians 2; Fairview 3 Knockraha 3. AUL 1A: Richmond v Donoughmore Ath (off); Buttevant 0 Waterloo 2. AUL 2: Strand Utd 6 CFC Banteer 2; Blackpool Celtic 2 De Courcey Albion 3. AUL 3A: Dunbar Celtic 2 Pearse Celtic 9. AUL 3B: Waterloo 1 Ballinhassig 1. Premier League: Innishvilla 0 Killumney Utd 1 (abandoned after 15 minutes). AUL 1A: Richmond 5 Millstreet Celtic 0. AUL 3: Greenwood 1 Knocknaheeney Celtic 1. AUL 3B: Strand Utd 4 Ballinhassig 0. Carrigtwohill United are looking for a Manager for their Premier A team. Strand Utd B 0 Dillon Cross Ath 2. Premier League: Kilreen Celtic 3 Park Utd 2; Killumney Utd 2 Blarney St Ath 0; Springfield 0 Greenwood A 0. Waterloo 4 Millstreet Celtic 1. AUL 2: De Courcey Albion 5 Newmarket Town 1; Strand Utd 5 Afton Villa 0. AUL 3: Innishvilla 2 Ard Na Laoi 2; St John Boscos 3 Castlelack 0; Glenthorn Celtic 10 Richmond 0. AUL 3B: Glanworth Utd 3 Bweeng Celtic 1. 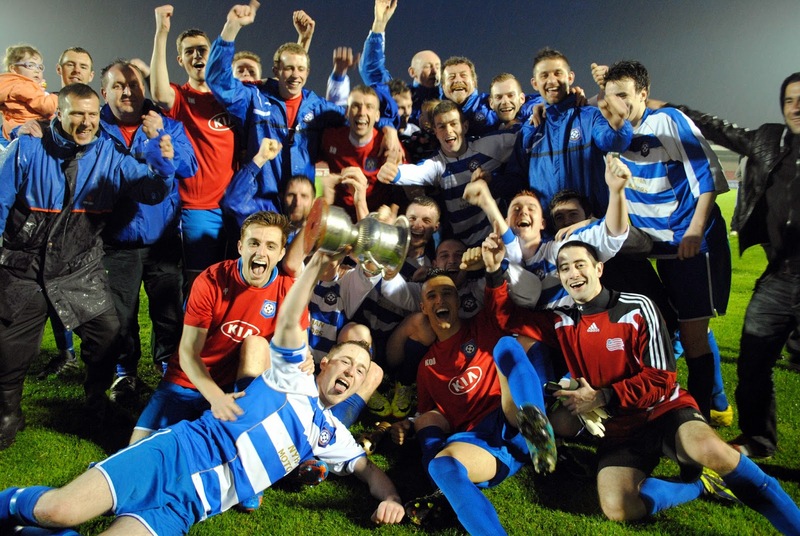 AOH Cup Final: Friday, 23rd May, Turner's Cross, 7.30 pm. Blarney Street Ath v Kilreen Celtic. 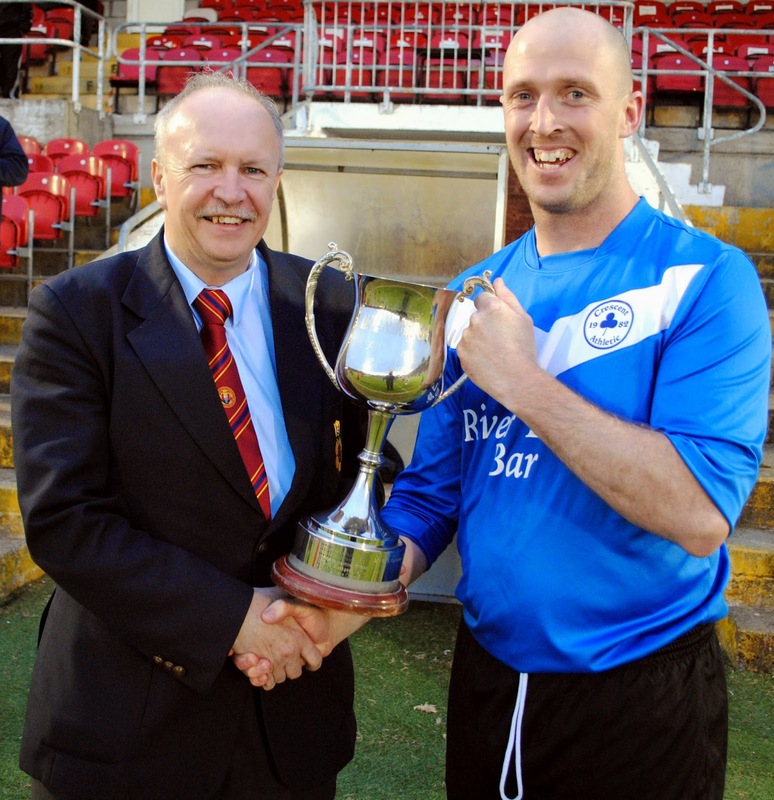 Crescent Athletic v UCC A.
Corinthian's Cup Final: Saturday, 31st May, Turner's Cross 7pm. County Cup Final: Sunday, 1st June, Turner's Cross 7pm. Premier League: Park Utd 5 Coachford 1; Blarney St Ath 0 Springfield 0; Killumney Utd 2 Innishvilla 1; Glen Celtic 2 Kilreen Celtic 3. Premier A League: Blackstone Rovers 0 Castleview 7; Grattan Utd 2 Village Utd 1. AUL 3: Innishvilla 0 Glenthorn Celtic 3. AUL 3A: Carrigtwohill Utd 2 Pearse Celtic 2; Crescent Ath 4 St John Boscos 1; Dunbar Celtic 1 Carrigaline Utd 3. AUL 3: Waterloo 2 Ballincollig 2. Park are well on course now to take the Premier title after another solid display saw them chalk up a 5-1 win over Coachford at home. Kilreen Celtic consolidated their position in second spot with a 3-2 win away to Glen Celtic who have now completed their season after playing their last game tonight. Innishvilla’s 1-2 defeat at the hands of Killumney means both themselves and Springfield have now been relegated to Premier A.
Grattan United are Champions of Premier A after coming from behind before running out 2-1 winners over Village United at O’Neill Park. Blackstone suffered a heavy 0-7 defeat at the hands of Castleview which now means that both themselves and Glenvale are relegated to the first division. Another solid performance by Glenthorn B saw them cruise past Innishvilla B 3-0 which moves them into the helm of the division now and they are really looking good for the title here. Crescent Athletic are Champions of 3A after an emphatic 4-1 win at home over Boscos. With one game left to play, they can’t be caught so, its congratulations to Lennie and the lads after a terrific league campaign. AOH Cup Semi Final Second Leg: Kilreen Celtic 1 Coachford A 0 (Kilreen won 2-0 on aggregate). City Challenge Cup Semi Final: Knockraha 2 Richmond 0. Corinthians Cup Quarter Final: Ballincollig 3 St John Boscos B 1. Premier League: Greenwood 0 Killumney Utd 2; Park Utd 6 Pearse Celtic 1; Innishvilla 3 Springfield 2; Glen Celtic 0 Blarney St Ath 2. Glenvale 1 Village Utd 3; Macroom 3 Carrigtwohill Utd 3. AUL 1: Bohemians 0 Dillon Cross Ath 5; Lakewood Ath 0 Fairview 6; Cathedral Celtic 2 Kanturk1. AUL 1A: Dunbar Celtic 8 Millstreet Celtic 3; Hibernians 3 Greenmount Rangers 1; Waterloo 8 Rathcoole Rovers 0. AUL 2: Macroom v De Courcey Albion (off); Strand Utd 4 Afton Villa 1; Blackpool Celtic 2 Newmarket Town 4. AUL 2A: Corkbeg 3 Grangevale 1; Shandon Celtic 2 Central Rovers 2. AUL 3: Innishvilla 1 St John Boscos 0; Richmond 0 UCC B 1; Glenthorn Celtic 6 Parkview Celtic 1. Well established club in the City are looking for an experienced Manager for season 2014-15. Any interested parties, please contact Daniel @ 086-3696644. AUL 1: Lakewood Ath 4 Bohemians 3; Knockraha 2 Kanturk 2; Fairview 2 Ballinhassig 0. AUL 1A: Dunbar Celtic 4 UCC 1; Richmond 1 Buttevant 0; Greenmount Rangers 0 Waterloo 2. AUL 2: De Courcey Albion 4 Strand Utd 1; Rylane Celtic 1 Blackpool Celtic 2; Macroom 1 Afton Villa 1. AUL 2A: St John Boscos 3 Hillington 0; Park Utd 1 Glen Celtic 2. AUL 3A: Pearse Celtic 6 Carrigaline Utd 2. In what is really becoming a three horse race here, being held to a 2-2 draw by Kanturk at home will not have been a good result for Knockraha tonight. Dillon’s are still looking strong on top but, Cathedral Celtic are ready to pounce in second spot if given a chance and while Knockraha will be involved in Cup duty next Sunday morning, Cathedral will have Kanturk to contend with at home – a big game for them now. Not much of a change here after tonights results. Richmond keep the pressure on leaders Hibs with a narrow win tonight while Waterloo keep in touch with a victory over Greenmount at Murphy’s Farm. What a result for De Courcey after their 4-1 win over second place Strand. They have certainly got themselves into the reckoning now after this huge victory. And take a look at the other one..... Blackpool Celtic’s 2-1 win away to top of the table side Rylane Celtic.... These two results have certainly thrown the cat among the pigeons. Boscos 3-0 victory at home to Hillington puts them in a very solid position with two games less played then leaders Central, they are just two points behind. Glen had a decent 2-1 win away to Park B but, with one game left, they look like being just that bit short come the end. Pearse Celtic had a decent 6-2 win tonight but, unless Leeview collapse altogether, it may not count for a great deal. Crescent just needs two points here by the way to claim the title – they have two games left. Tuesday, 27th May: Crescent Ath v UCC A. City Challenge Semi-Final: UCC 1 Fairview 0. Premier League: Innishvilla 1 Kilreen Celtic 3; Springfield 2 Killumney Utd 3; Glen Celtic 2 Coachford 5; Greenwood 3 Blarney St Ath 1. Premier A: Glenthorn Celtic 2 Macroom 1; Blackstone Rovers 1 Glenvale 1; Village Utd 1 Douglas Hall 3; Carrigtwohill Utd 2 Castleview 5. AUL 3: Castlelack 0 Glenthorn Celtic 7. AUL 3A: Crescent Ath 3 Tower FC 1; St John Boscos 2 Carrigtwohill 1. AUL 3B: Ballincollig 4 Bweeng Celtic 2; Strand Utd v Ballinhassig (off). Saturday 11th Oct v Gibraltar, Wednesday 3rd September, and Tuesday 18th November Friendlies; Sunday 29th March v Poland, Sunday 7th June v England, Saturday 13th June v Scotland. The opportunity to purchase additional tickets for the Friendly Game v England on 7th June 2015, tickets for that game are unlikely to go on general sale. Purchase 2 tickets @ €240. Organise a Club members draw for each of the 3 anticipated sell out games selling 100 tickets @ just €10 each giving a return of €3,000 on an investment on the 2 tickets. With the 3 games being played on Saturday and Sundays and Irish Rail putting on special trains after those games it will be ideal for people to have a great day out and supporters will not be inconvenienced in getting home after the games. Kindly contact Tony Fitzgerald to order tickets. St Michaels Cup Final: Knockraha 0 Richmond 2. AOH Cup Semi Final 2nd Leg: Blarney St Ath 1 Killumney Utd 1 (Blarney Street won 9-8 on pens aet). Corinthians Cup Quarter Final: Strand Utd B 5 Blackpool Celtic 4; Lakewood Ath A 2 Bohemians 0; Dillon Cross Ath 3 Greenmount Rangers 1. Premier League: Kilreen Celtic 4 Pearse Celtic 0; Innishvilla 2 Glen Celtic 4; Springfield 2 Park Utd 3. Premier A League: Glenthorn Celtic 4 Village Utd 2; Blackstone Rovers 3 Macroom 3; Glenvale 1 Carrigtwohill Utd 5; Castleview 1 Grattan Utd 1. AUL 1: Cathedral Celtic 5 Ballinhassig 1; Watergrasshill Utd 0 Fairview 6. AUL1A: Rathcoole Rovers 2 Dunbar Celtic 0; Donoughmore Ath 0 UCC 2; Waterloo v Millstreet Celtic (off). AUL 2A: Park Utd 3 Grangevale 2; Glen Celtic 4 Corkbeg 0; Hillington 2 Central Rovers 5. AUL 3: UCC 1 Glenthorn Celtic 5; Greenwood 4 St John Boscos 2; Ard Na Laoi 0 Knocknaheeny Celtic 5. AUL 3A: Leeview Ath 5 Carrigaline Utd 3; St John Boscos 2 Tower FC 2; Crescent Ath 3 Pearse Celtic B 2. AUL 3B: Ballinhassig 0 Glanworth Utd 4; Los Zarcos 0 Ballincollig 4. Richmond celebrating with the St Michael's Cup following their 2-0 victory over Knockraha at the Cross on Friday night. AUL 1: Fairview 0 Kanturk 1; Lakewood Ath 4 Watergrasshill Utd 2. AUL 1A: Waterloo 2 UCC 1; Dunbar Celtic 3 Hibernians 1. AUL 2: Blackpool Celtic 0 Afton Villa 5; De Courcey Albion 1 Rylane Celtic 2; Macroom 1 Strand Utd 5; Newmarket Town 3 CFC Banteer 3. AUL 2A: St John Boscos 4 Corkbeg 2; Grangevale 2 Glen Celtic 1; Park Utd 0 Central Rovers 0. AUL 3A: Pearse Celtic 3 Carrigtwohill Utd 5. It’s certainly squeaky bum time after some of the results tonight. Things are not working out for Fairview at all - in their efforts to play catch-up with a very congested backlog – losing again tonight against visitors Kanturk 0-1 has all but ruled them out of any chance to try and catch up with the front-runners. But it was never going to be easy. At Ovens, it was a huge result for Lakewood in their battle against relegation after a 4-2 home win over fellow strugglers Watergrasshill. What an absolute sensational result tonight in 1A with Hibernians losing a league match for the first time this season after going down 1-3 to Dunbar at Murphy’s Farm. This result now makes it all the more interesting again now as the race for the title hots up again as a result of this. Waterloo jumped into third spot following their narrow 2-1 win over UCC A at home. This win keeps them very much in touch and I am sure they will be driven a bit by the Hibs result tonight. Rylane Celtic strengthened their grip at the helm tonight with a 2-1 win away to De Courcey. With five games left, they are certainly the in-form team at the minute. Afton Villa produced a massive win after running out 5-0 winners away to Blackpool Celtic which will certainly have boosted their efforts to survive in this league no end but, Blackpool Celtic’s interests now on promotion have all but gone after this setback. 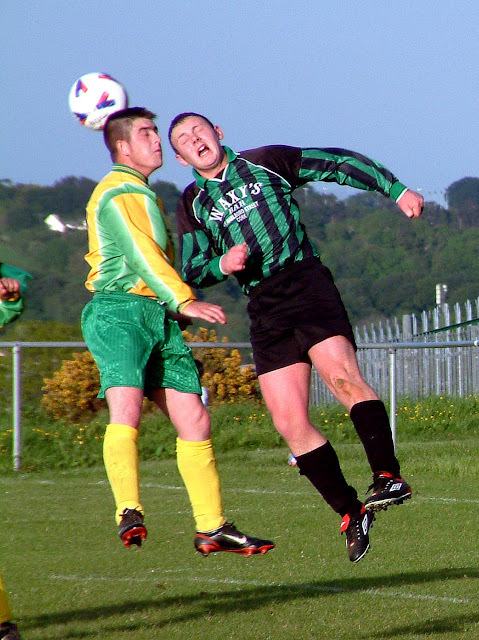 Leaders Central Rovers were held to a 0-0 draw down in Mitchelstown against Park B but, down in Water Rock Park, Boscos have now emerged as favourites for the title after a significant but, very hard-earned 4-2 victory over neighbours Corkbeg. This victory now leaves Boscos in second spot – two points behind Central but, with two games in hand – a nice position to be in at this point in time. What a result tonight for Grangevale after their 2-1 win at home to Glen Celtic A. And while it was a step back for Glen, it certainly makes Grangevale safe for second division football next season. Pearse Celtic B’s 3-5 defeat at the hands of Carrigtwohill will have done their aspirations for promotion no good at all tonight and next Sunday morning against leaders Crescent Athletic, they will have to go all out for the three points if they are to keep their interests alive.